At my last bookstore author presentation, I included a song. I’d gotten the idea of using music to jazz up the event from an article in the SCBWI bulletin. It seemed a perfect fit. I was a music major and a songwriter, so what could go wrong? I put my new lyrics to the old song, “Bicycle Built for Two,” got some 6th graders who agreed to come and sing, et voila. The only problem was, only one singer showed up, and she was not a strong singer. I hadn’t provided any accompaniment because guitars are so bulky and I feel too inferior to play anyway, because my husband is a very good guitarist. (My senior recital instruments were piano and recorder.) So it was just me without any instrument to keep us on tune and a couple of game adults. It did not jazz up the event. It made it awkward. That was my take on it, anyway. So why would I even think about trying music again? Because I have a library event coming up and I’m really horrible at crafts and I needed something more special than just a coloring page. And these kids are supposed to be young. Little kids love music and they don’t tend to be snobs about it. But I learned from last time. I needed accompaniment. Brain-flash: a ukulele is small. And it only has four strings instead of six. And my husband doesn’t play it (although I’m sure he will abscond with it soon and become brilliant). 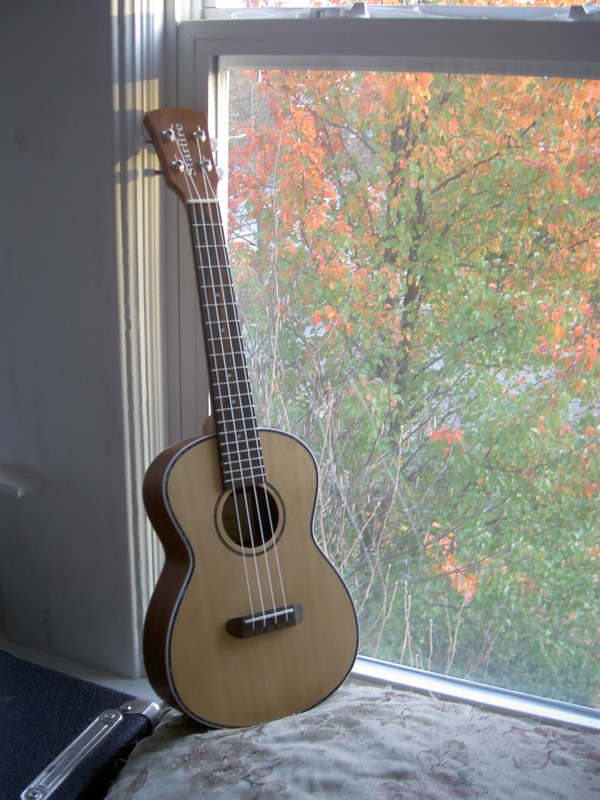 I immersed myself in ukulele info on the internet and saw some really awesome performances that I will not aspire to (Jake Shimabukuro, you are amazing), learned about the different kinds of ukuleles and decided on a tenor. I also decided to go cheap, because who knew if I would even like this instrument? (I got a mandolin once that I thought would solve my string instrument problems. Long story short–it didn’t.) Found a ukulele on Ebay and took the plunge. And it has been such fun. Unless you hear Jake play it, the ukulele does not seem like a serious instrument. So it’s easier to just let go and enjoy it. No pressure. Within a few days, I had two simple songs down I could play at the library event. Soon I added another possibility. And now I find myself picking it up just to mess around with it. Stay tuned to see if the library music works out. Either way, it’s been a fun jaunt. What songs can you think of to go with your own book or a favorite book? I like to approach ways that I write and pieces that I write from different angles. You don’t always get the best perspective straight on. Sometimes the most interesting things happen after you play with the form. 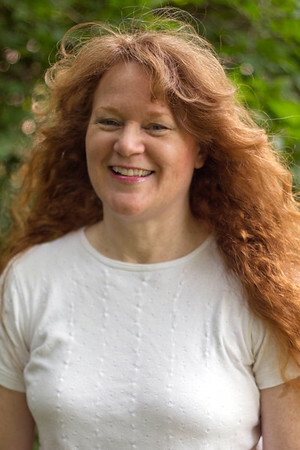 My work-in-progress novel, (Three Prayers) began because I couldn’t let go of this picture book manuscript I’d written about a chimney swift falling down my chimney and into my house. The manuscript wouldn’t sell, but the words and images wouldn’t leave my mind. So I let them flow freely, and now I have a novel (that will hopefully be more publishable) that includes the evocative image of the chimney swift. The poem below was used in a more utilitarian manner. While I was putting together the skit book Skitsophrenia as an editor, I needed to fill a gap. I pulled this poem that had been published years earlier and made it into an artsy skit. 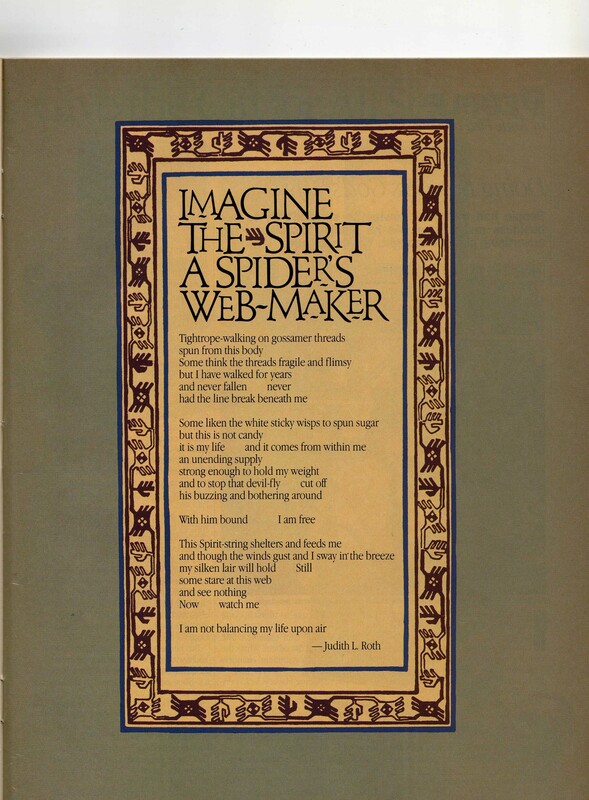 Here is my poem as published in Moody Monthy, December of 1986.